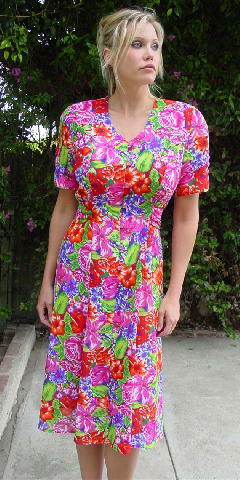 This vintage Classics by Leslie Fay Petite dress is 100% polyester. The fabric is somewhat sheer and has a crinkled vertical line effect with flowers and leaves in pinks, greens, oranges, purples, and white. It has an 8 1/2" V neckline, shoulder pads, and short sleeves with three buttons and loops on each. 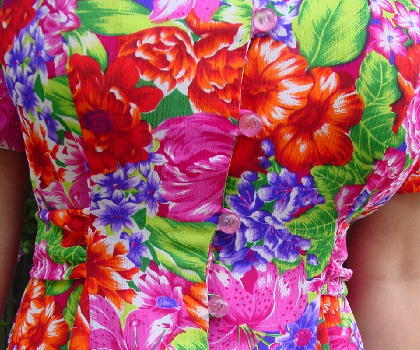 There are two snaps and 7 pink rounded buttons (like the ones on the sleeve) down the front. 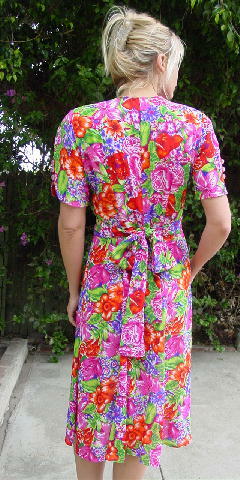 The front has two 40" by 3 3/8" wide double sided ties by the waist which tie in the back. There is a pink loop in the back for the ties. The tag says size 12, but it fits more like a size 6/8.